Just one book today, mainly because I got this on NetGalley and you can save time by just putting a link in to your review when submitting feedback. And it’s the only one I’ve got outstanding at the moment, and just sometimes it’s good to be nice and tidy at the end of the month (my TBR is anything but. This will change). This book now rather famously (as it won the Samuel Johnson prize for non-fiction between me acquiring it and this review) sets out the history of research on, attitudes to and treatment of autism (and what eventually became known as its spectrum). It starts off with a couple of descriptions of scientists from history who we would say now are “on the spectrum”, not in a move to retrospectively diagnose them but more importantly to highlight their huge contribution to the development of science, which would not have been possible without their distinctive personality traits, which is the central theme of this book. Some of the historical sections on diagnosis and treatment would be distressing for people with autism in their immediate family to read and were on the edge of my tolerance: but it’s important for the author to set out the arguments around eugenics and around aversion therapy (the latter being practised until almost the present day), both of which were represented, of course, at the time as “science”, because we need to know and remember what has happened in the past. The mix of history and modern stories of advocacy and empowerment make for an engaging read; it was good to come across “old friends” such as Temple Grandin, the subject of one of Oliver Sach’s books. I particularly liked the autism activists who arose and grouped together with the development of the World Wide Web and collaborate with others in the disability advocacy groups; less welcome was the in-fighting and one-upmanship amongst the various autism organisations, but this is typical of all movements and again, needs recording. The book makes a convincing argument for two main strands: one, that we don’t have an epidemic of autism, but a rise in diagnosis (a process which he pulls apart forensically and convincingly) and the other that there are huge benefits to neurodiversity, much as there are to biodiversity: different kinds of minds are needed for different situations, and we shouldn’t strive to make everyone uniform. This book will suit … anyone interested in autism and Asperger’s Syndrome (with the caveat that some stories of the Nazis and of treatments meted out in the 20th century could be found distressing). A study of a week in the life of cousins Maurice and Edward. Both are vicars, but with very different theologies and world-views, and indeed lives, with Maurice a perpetual invalid and bachelor, mainly it feels out of pique at being pipped to the post of marriage to Margaret, who is now, of course, married to Edward. Maurice is, as you would imagine, fussy and pernickety, Edward academic, remote and posh (and a bit peevish, too – what a lovely pair they are). But Margaret is still Maurice’s ideal and idol, and he curiously worships Edward, too, only too eager to take a “holiday” looking after his parish while the whole family is away. We meet Maurice and, first, the daughter and new dog of the house on the eve of Margaret and Edward’s return. There follows a week in which happenings are revealed out of order and in a tumble of mixed impressions and blurry pictures, women use their various powers and share tips on doing so, the churchwarden appears to be implicated in one set of wrong-doings and Edward appears to be implicated in yet another, all giving rise to all sorts of misunderstandings and poppings between the vicarage and the churchwarden’s house that would be material for a farce if it wasn’t so hothoused, sour and over-dramatic. Young draws them all so perfectly and cleverly, capturing all the nuances. Not a comfy read, but a well-observed and slightly cringey one, notable for seeing marriage as warfare and family as stunting at a time when these opinions would not be popular if expressed in public. This book will suit … Virago readers, perhaps Barbara Pym and Elizabeth Taylor fans, as it’s a “cool” book, observed and detatched rather than messily involved in all the emotion. A clever conceit in this standalone novel sees three women in their 30s meet in the centre of an American college campus at their 15-year reunion. The cheerleader, top law student and professional bad girl hadn’t known each other way back when, but they sit down, get to know each other and share their stories – each revolving around the fact that they were so sure about their futures as they finished college, but then found them twisting in unexpected ways, from running off with a biker to discovering a latent maths genius. And what happened to that hapless groom (or grooms)? As the evening comes around the women prepare to attend the big party, maybe we’ll find out by the time we get to the end. A refreshing and fun read. We’re in a new (well, new to me) eight-book series here, set in the small town of Promise, Texas (which is almost Larry McMurtry land), with its ranchers and business owners, long-established families and new folk in town. Each of these two books contains two self-contained novels, although they’re best read in the series like this. In “Lonesome Cowboy”, Savannah meets and falls for a hitchhiking cowboy, seemingly down on his luck, but her brother Grady, who’s been running the ranch with her since their parents died and their younger brother ran off with their inheritance, is not convinced. “Texas Two-Step” brings Ellie to the centre: she runs the feed store and is in mourning for her late dad. She leans on best friend Glen, but then Richard Weston from the first story starts sniffing around and there’s an embarrassing scene at a dance before things can work out how they should do. I liked the chorus of gossips and the stern retired schoolteachers in this one. In the clumsily named “Caroline’s Child”, it’s the turn of postmistress Caroline and the fabulously grumpy Grady to take centre stage. They’ve sparred for years and he’s a bit of a caricature where the ladies are concerned, but do they actually care for each other? All would be well but for the mystery parentage of her five-year-old, Maggie (who is well observed in her part of the adventure). “Dr. Texas” is the new girl in town in the fourth, funny, novel – she’s a Californian through and through, getting money off her student loan by working in the tiny medical unit in Promise and planning to get out of there as soon as she can. But then she starts making friends and getting to grips with the Texan ways … and men! 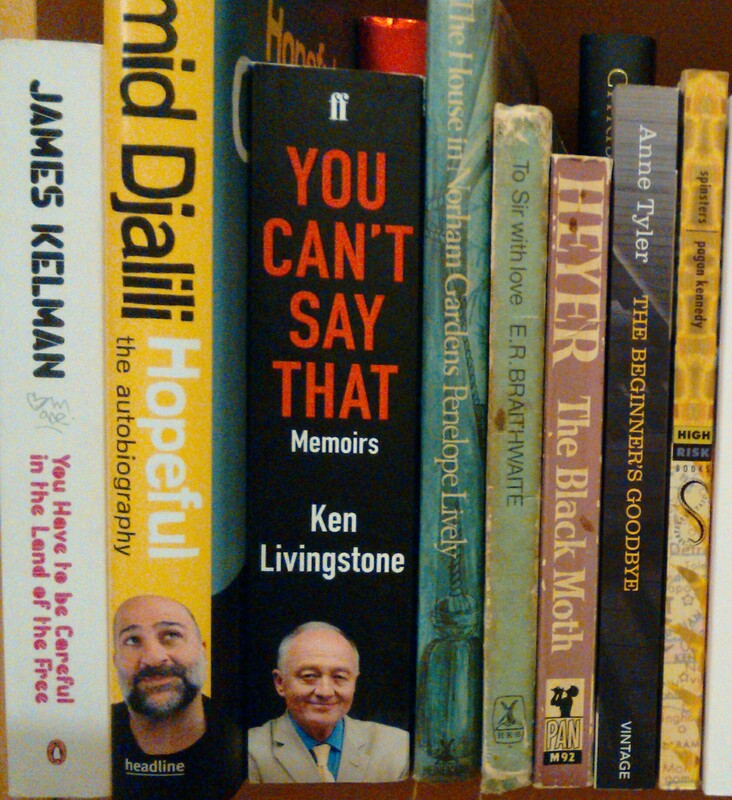 Well, that covers a bit of reading, and here are the two non-fiction review copies I’ve also finished. “Ivory Vikings” was read for the lovely online magazine, “Shiny New Books” – there’s going to be an Extra Shiny coming out at the beginning of December which will feature this review. I’ll link to it when it comes out, as I have had to save my review for the magazine. It was an interesting book, though, linking the Lewis Chessmen into pretty well the whole of the Nordic world by using different chess pieces to tell social and political history. The other book is Steve Siberman’s “Neuro Tribes”, which has just won the Samuel Johnson Prize for non-fiction – I got that one from NetGalley. It’s a history of attitudes to, research on and treatment of autism which was very interesting and engaging. I’ll be reviewing that one on here, but separately (because NetGalley lets you link to your review on your blog, which is useful). A couple of confessions to round off this mega-post. First off, my lovely friend Julie, who is going through the ordination process, was downsizing her Virago collection, and I was the lucky recipient of Dorothy Richardson’s “Pilgrimage” vols 2 and 3. I had had vol 1 for ever, and picked up 4 last year in a charity shop, so this was most fortunate. And I’m hatching a plot to read all 13 sub-volumes, one per month, starting in December, as I’ll have finished the Forsyte Saga by then and a couple of people want to read along. And the other ones, see above. I’m really getting into my running again, I’ve run three half-marathon distances in the last three months (including that airfield one, ugh), and I want to improve my form and stamina. So I asked for recommendations and have picked up these two books. I’m not going to overdo it or hurt myself, but if I want to do a marathon next year (which I MIGHT want to do), it would be useful to get a bit stronger and quicker. So some runner reading to do. And running, obvs. There we go – did you miss me, then? Probably not after that mammoth read – ha! If you’re a book blogger reading this, I’m behind with your blogs, too, but will catch up soon, promise! 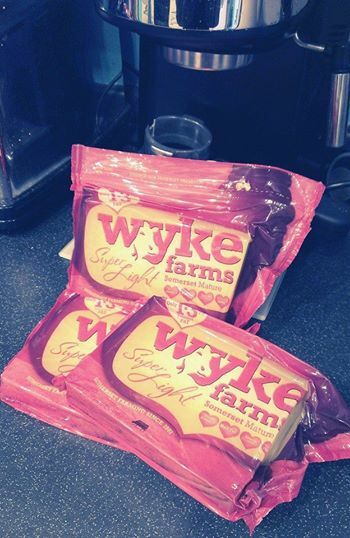 Wyke Farms: Please change your mind on your Superlight Cheese! Way back when I discovered I had high cholesterol and became determined to get it down using diet rather than drugs, my friend Gill went to the Good Food Show and came back with some SuperLight cheese by small producer Wyke Farms. Hooray – created for a family member who had high cholesterol himself, this cheese had only 1.5% saturated fat. And. it tasted really nice. Like proper cheddar. Because it was proper cheddar. Cheese you would want to cut a slice off and actually eat (but would melt nicely on toast or on top of your pasta, too). I wrote about it in my book. I wrote about it in this blog. And then, I went to order it again and it was NO LONGER THERE. I got in touch with Wyke Farms. They had had to discontinue production. PS Wyke Farms are in no way connected to this blog post. They will know about it about 2 minutes after I posted it, because I’m going to tell them, and they might share my plea if I’m lucky, but this was done entirely off my own bat. Oops – I’m a bit late with this one, as it’s been a busy day. 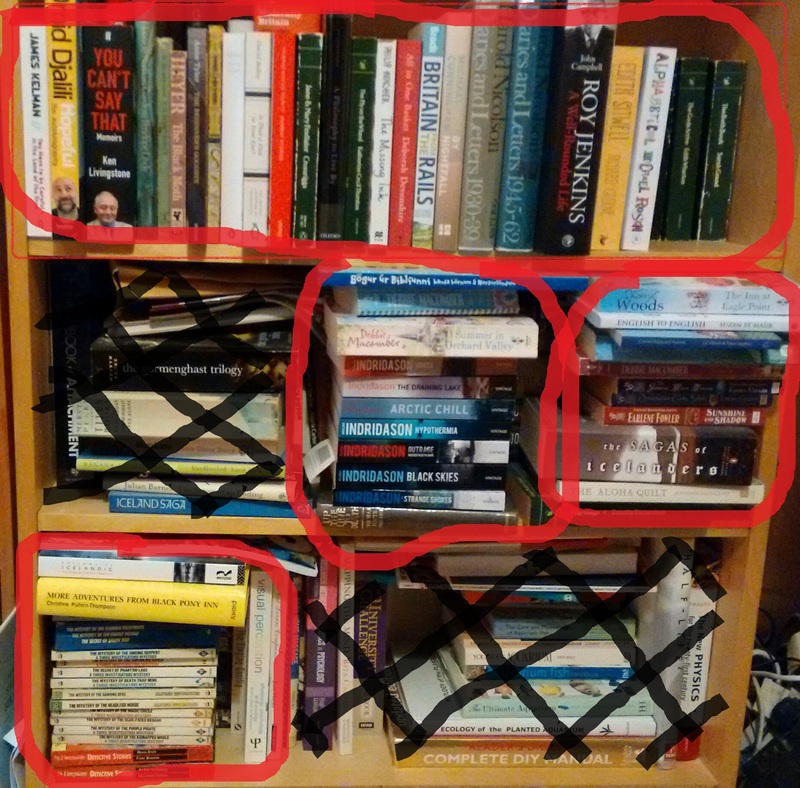 Anyway, the TBR has gone a bit major: this post explains how it happened, although I then added five more substantial Viragoes (pictured here). And I haven’t shared the full nightmarish horror of it all before now (have I), including the standard double stacked TBR to be read in order of acquisition, the “Debbie Macomber and books in series” pile, the “Three Investigators and pony books” pile and the Arnaldur Idriðason pile, which results in the bookcase that holds Matthew’s and my TBRs looking like this (the circled ones are mine, sitting neatly in front of rows of other, tidier books). Oops, indeed. 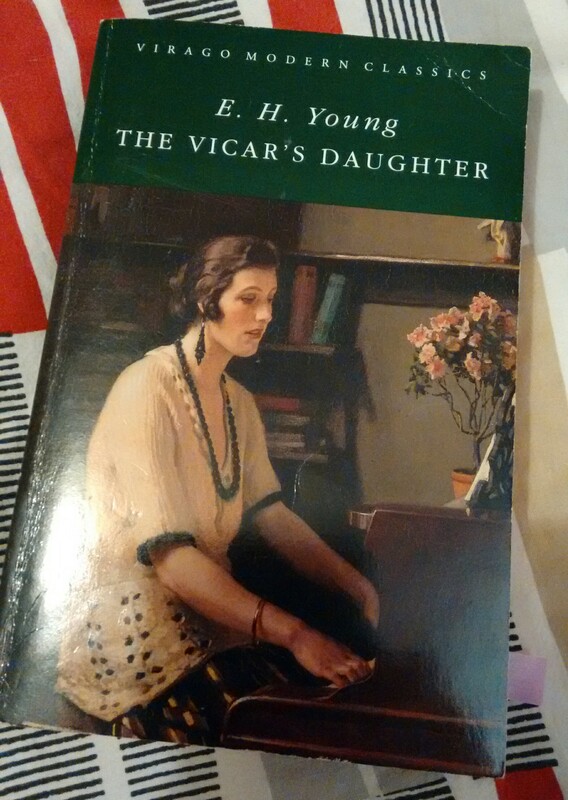 Aaaaaaanyway, moving swiftly on, I’m currently reading the subtle and horrifically well-observed “The Vicar’s Daughter” by E.H. Young, which was sent to me by fellow book blogger and commenter-on-here Kaggsy – a lovely Virago and a good and absorbing read. I am about to start a lovely-looking non-fiction book that I’m reviewing for Shiny New Books – I admitted that I can never remember if we’re allowed to reveal what we’re reviewing before the mag and review comes out, but two of the editors kindly commented on this post, so I can reveal that it’s “Ivory Vikings” by Anne Marie Brown – exciting! Coming up, I got a bit confused, because I was sure that this picture was oh, too similar to October’s one – however, I know that I have in fact read 11 books in October. How did this happen? Well, for a start, I was still reading three books as the month started, which were off the TBR. Then I read three Debbie Macombers off my DM pile, and two ebooks, one loaned book and one book that I bought within the month for the 1924 Club. When you add those up, it does work, honest. And these are indeed the books that are coming up. So, the perennial questions – how is YOUR TBR doing, what have you got coming up, and have you read any of these lovelies?